The new Fiscal Year has already begun for HMRC (Happy New Year) and they will be preparing to send out reminders to everyone who must submit a Tax Return also known as an SA100 for the year just gone, year ending 05/04/2018. Here are a few basic things you should know for the year ahead. The standard Personal Allowance for the current Fiscal Year is £11,850.00 - which is the amount of income you do not have to pay tax on. Your Personal Allowance may be bigger if you claim Marriage Allowance or Blind Person’s Allowance. Your personal Allowance is less if your income is over £100,000.00. 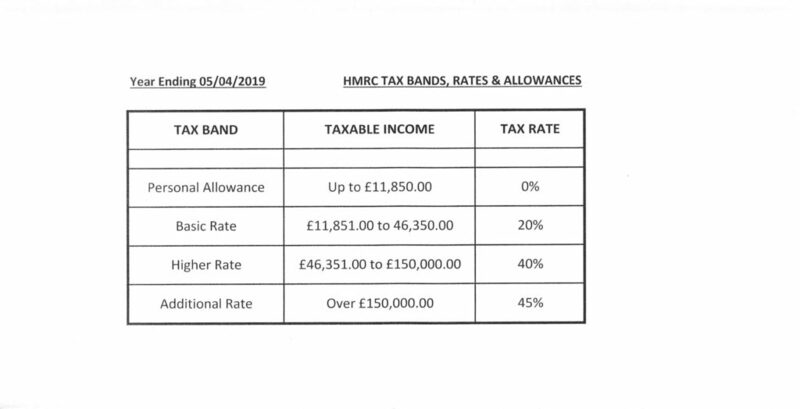 The table below shows the Income Tax rates you pay in each band if you have a standard Personal Allowance of £11,850.00 between 06/04/2018 and 05/04/2019. SUBMIT TAX RETURNS ONLINE NOW!